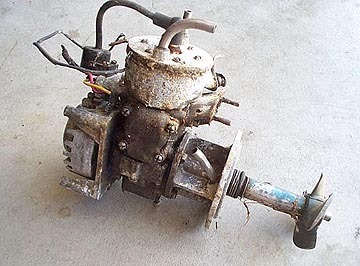 The engine was in pretty sad condition, but it did turn over and it was complete except for a small mechanical switch assembly on the head which allows the compression to leak out the head and help to start the motor. Most of the plumbing was intact so we carefully removed the tubes, and noted their connections to replace them. 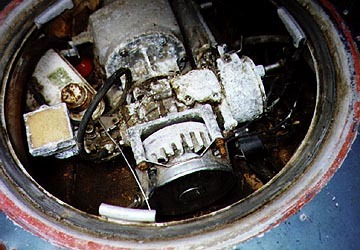 The motor is fixed to the board by a bolted connection the jet drive housing. The exhaust is also fixed to the inside of the board, and is hooked into the water cooling system. Water is blown out the rear of the board where there is an inlet for the cooling system. This then comes forward to the exhaust, runs through the exhaust to the head, and then returns to the start of the jet drive area. 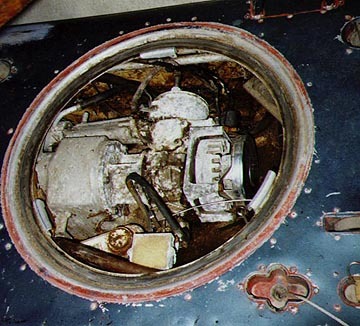 The engine is removed by removing the bolts at the jet drive assembly, and gently tapping the motor to break the seal. The original gas tank was missing and someone had added a small aluminum one from a lawn mower. Above is a shot of the empty engine bay. You can see the exhaust above jet drive flange. 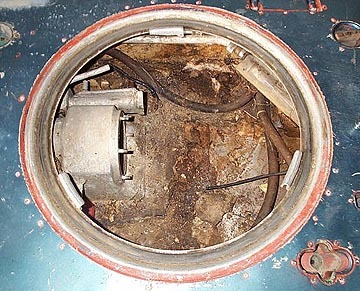 Also the sump pump system is visible at the upper right hand side of the circular opening. This is covered in a later section of this site. 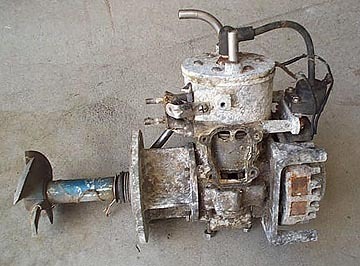 Once the engine was removed we could get an idea of what was in store for us. It is a direct drive from the crank to the small 4 blade propeller which is located inside the jet tunnel. There are transfer access covers (shown removed) on each side of the barrel. The only reason I can see that these would be required is because of the way the barrel is made. The head and barrel are cast as one and then the steel barrel surface is sleeved into the casting. It would be a very hard casting if the transfer walls were included in the casting so I assume they made them removable. The shot above is the side of the engine that is visible when the board cover is opened. This shot shows the hidden side of the engine. The corrosion to the aluminum casting is worse here. You can see the wiring from the stator to the HT coil, and also the water cooling return is visible just before the propeller shaft.